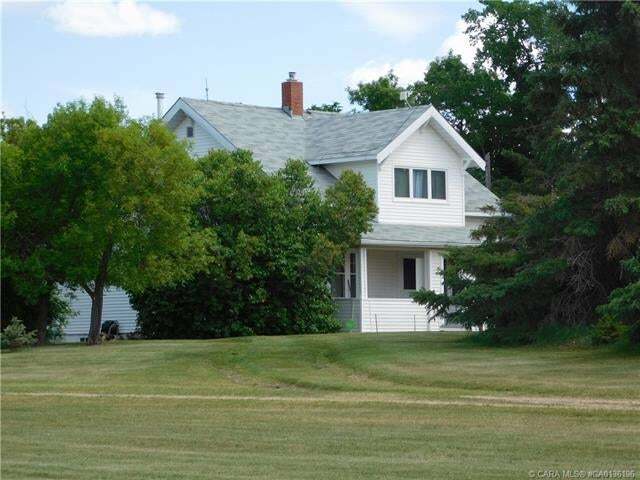 Minutes from Camrose you will find quiet country living with a dream location offering easy access to both highways 21 and 13. Nestled within this beautifully treed acreage, a charming 1.5-Storey character home offering 1817 sq. ft. along with 4 bedrooms awaits you. You will marvel at the possibilities provided by a large kitchen with oak cabinets along with a substantial room creating options for living and dining room spaces. Added comforts are provided by a cozy woodstove, main floor master bedroom and a fitting spacious porch. The upper level offers 3 more bedrooms, a flex room and the main bath. The basement provides a large family room, laundry facilities, multiple storage rooms and a handy separate entry. Outbuildings include both a double, and a single garage as well as a shop and multiple sheds. A super opportunity for a serene lifestyle within easy commute to all the amenities. Not to be missed! Lot Size 4.58 Sq. Ft.